When I was growing up I remember learning about historical figures at school. Florence Nightingale, Alexander Bell and Louis Pasteur to name a few. 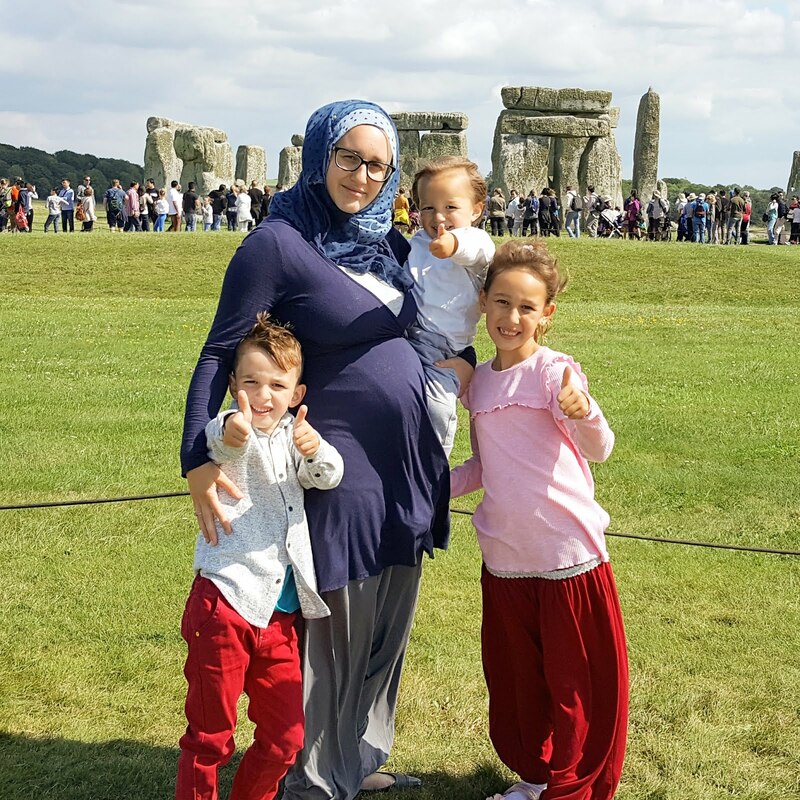 I realised it is important for me to teach my children about people who have achieved great things in their lifetime, as a way to inspire and motivate them as well as increase their knowledge of the world. Not only is it fascinating to learn how these people learnt and developed their passions and talents, it is also a great way to start learning about different topics such as art, fashion and science. 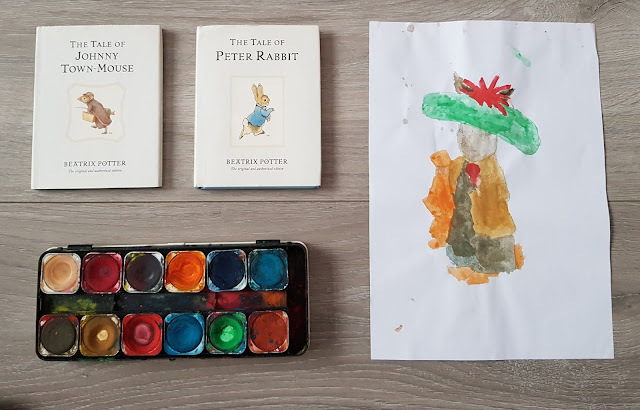 I decided to start with learning about Beatrix Potter as all three of my older children love or have loved the books she wrote and I was interested in exploring the topics of creative writing and painting with my them. We started off by learning some facts about Beatrix Potter. 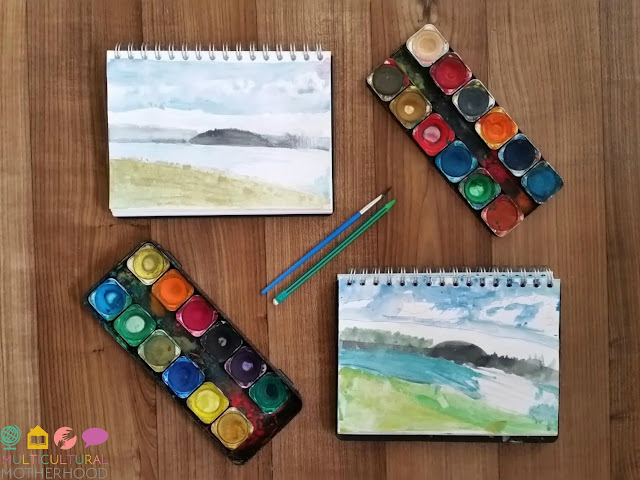 We learnt she was homeschooled and allowed to spend her time doing what she enjoyed - watercolour painting. She loved the outdoors and wild animals and would often bring home creatures she had found outdoors and keep them as pets while she studied and painted them. Not only did she like painting animals, she also enjoyed painting scientific pictures of fungi. 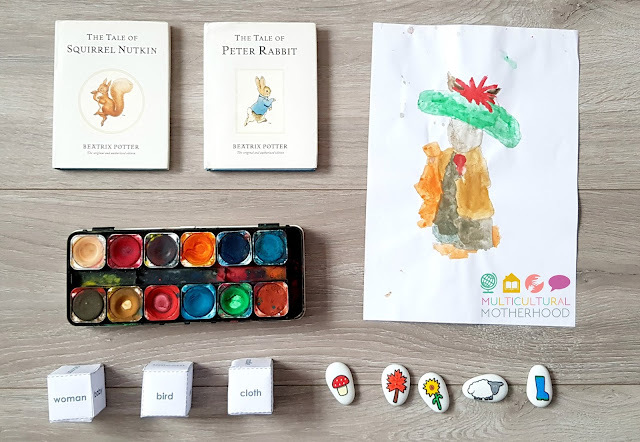 Beatrix Potter wrote her first book - Peter Rabbit - in 1902 and was inspired by a letter she had written to her old governess' son. She went on to write 23 books in total in the Peter Rabbit series of books. She wrote other books too. To begin the hands on tasks, I asked the children to imagine short stories of their own. We had not done much creative writing previous to this so I used some writing props to help them. We started off by using our Imagistones story stones. These are a great way to get the imaginative juices flowing. There are many ways to use them, which you can read about here, but perhaps the simplest way is to pull them from the bag one by one and make up a story as you go along. 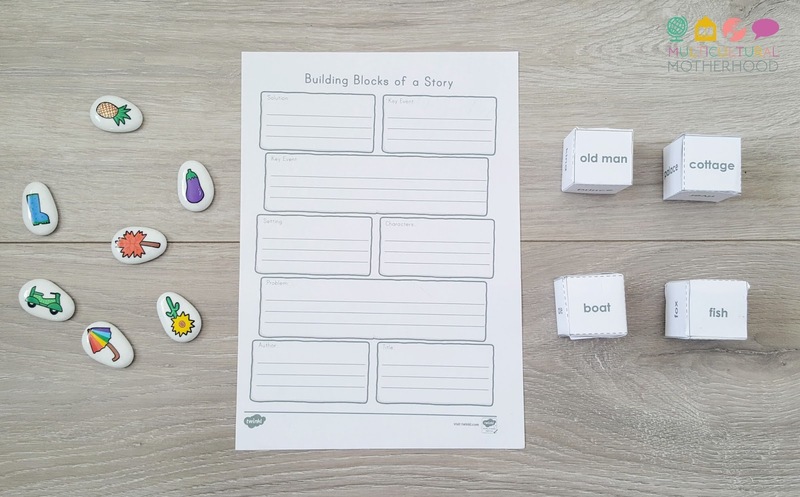 I downloaded this useful storytelling worksheet to help the children organise their ideas. 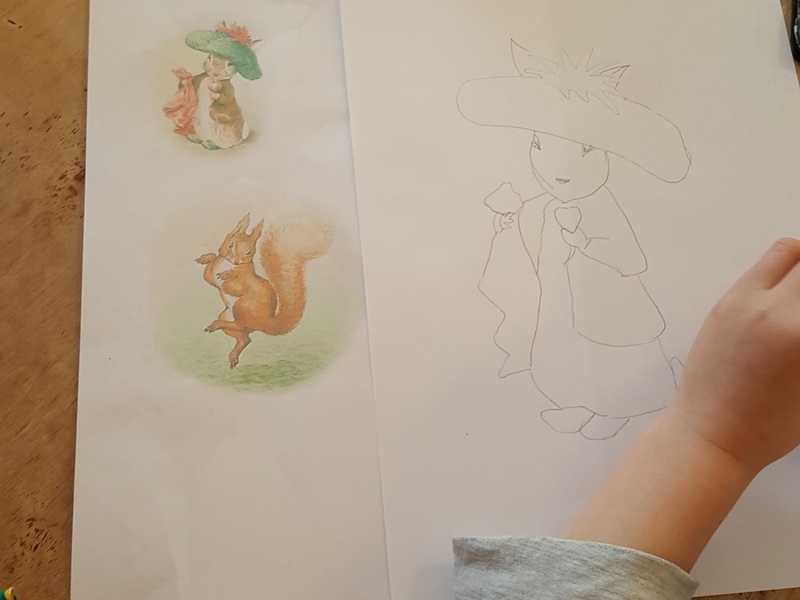 I talked through the worksheet with them, explaining that stories need to have a beginning, middle and end as well as characters and a setting. They also need to contain a problem and a solution to that problem. There were also some story dice on hand if the children got stuck for ideas but to my surprise the ideas flowed naturally. After writing our stories it was time for some watercolour painting. We paint quite often as we have kept nature journals since last summer, a pastime the children have been enjoying. I gave the children pictures of some of Beatrix Potter's characters but also encouraged them to create their own characters. 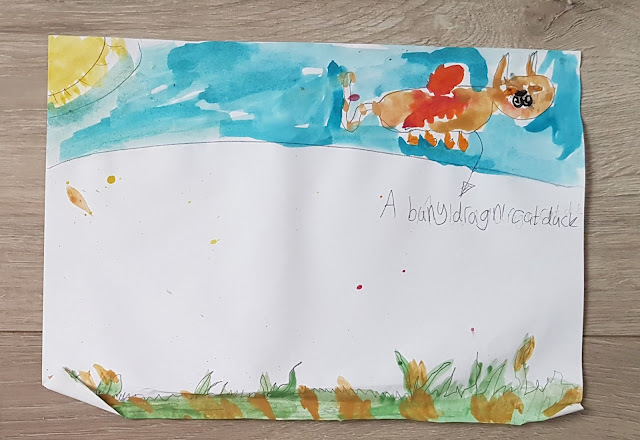 D came up with the painting above, her own character. R asked me to sketch pictures of the characters for them and then they painted them with watercolour paints. Next, we learnt about the Lake District, the place Beatrix lived most of her life and the setting for her stories. 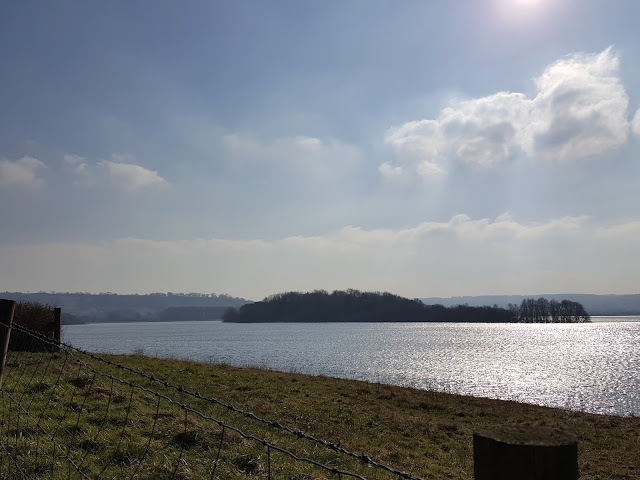 It was too far for us to travel to the Lake District so we took a trip to one of our local lakes instead to try and imagine what it would be like to get creative in such a setting. We tied this in with our nature curriculum studies and you can read more about our trip here. We spent a wonderful day by the lake and when we got home we painted pictures of the lake in our nature journals. Finally, D and I enjoyed watching the film 'Miss Potter' which looks into Beatrix Potter's personal life. The boys were a bit too young to appreciate this film, however, they did enjoy watching the new film 'Peter Rabbit' at the cinema. We thoroughly enjoyed learning about the life and books of Beatrix Potter. We enjoyed creating our own stories and watercolour paintings. I would love us to continue to work on both of these skills and find ways to practice ad improve them. Perhaps we may take a trip to the Lake District one day to discover the wonders of it for ourselves. Feed the Baby Hummus Book Review + Giveaway!